Wishing you were here! 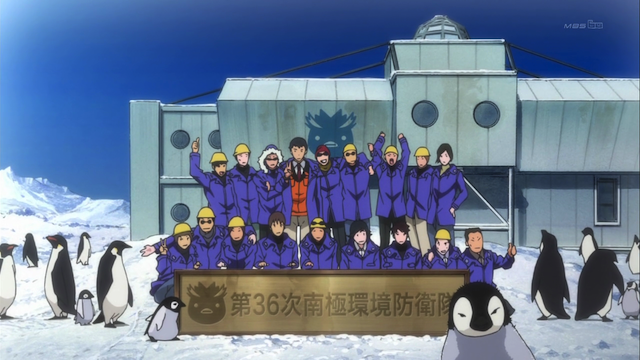 Kenzan Takakura and co-workers (and penguins). Mawaru Penguin Drum continues to astound. 12 episodes in and we are still getting bizarre revelations that make us question what the exact nature of this show really is. 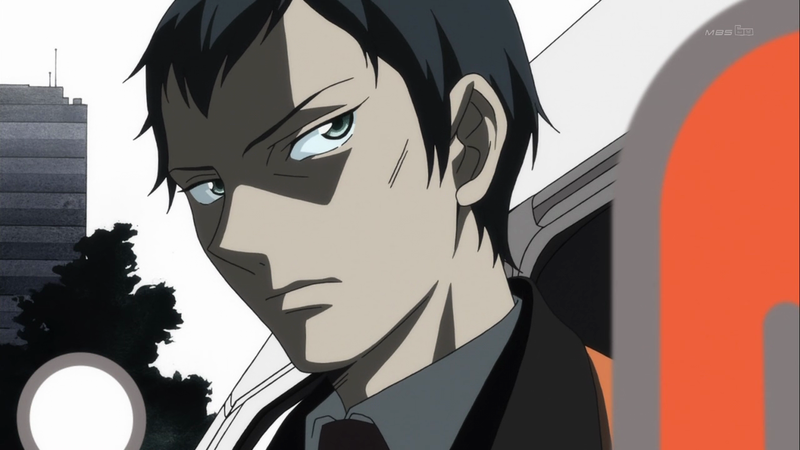 The big shock we were expecting was Shouma’s explanation of why he feels responsible for Momoka’s death. We got that and so much more! 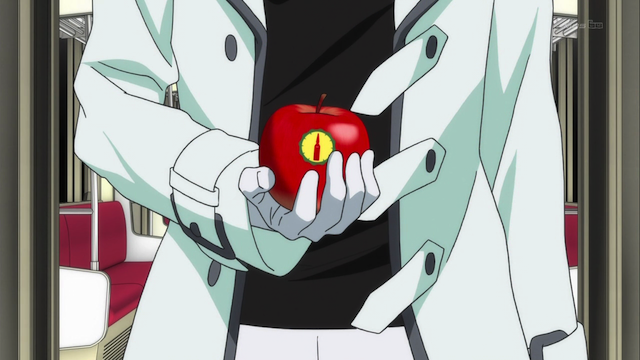 Sanetoshi has an apple marked with a different logo. Does he represent a different faction, or something even more sinister? 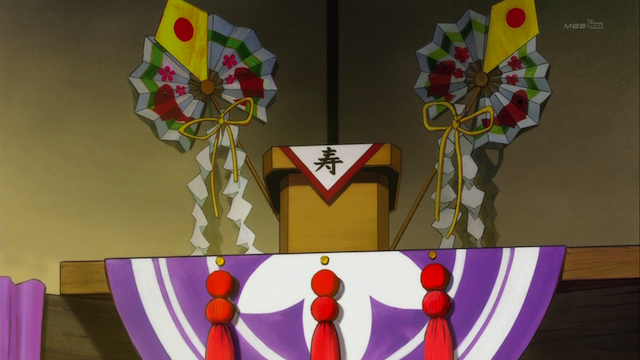 The episode starts with the same monologue we got in episode 1 (“I hate the word FATE”). This is always classy, and especially when used like this, the same words in the mouth of a different character, which gives the words a different meaning. I believe the first time the words were uttered by Kanba, and seemed to be about him and his siblings. This time the voice seemed to belong to Kenzan, Kanba’s father, and thus the lines, “Because ever since that day, none of us had a future.” seemed to be directly related to the sarin attack. I also didn’t recall, until these lines were repeated in this episode, that there was a relation between this monologue and the Survival Strategy speech. The monologue says, “The only thing we knew was that we would never amount to anything,” which is what Himari’s alter-ego (who Sapphire Pyro calls the Crystal Princess) says: “Listen, you lowlifes who will never amount to anything”. And, YES, I am still talking about the first few seconds, before the opening credits roll. It was one of those episodes, again. Kenzan leads the deadly terrorist attack. Shouma reveals that his parents were leaders in the organization that carried out the 1995 sarin gas attacks on Tokyo’s subways (in real life, this was the Aum Shinrikyo sect). Personally this came as a shock, because previously we had only seen Kenzan and Chiemi Takakura as loving parents, willing to suffer for the sake of their children. I also can’t quite imagine what it would be like to be Ringo, and hear her friends take the blame for the terrorist attack that killed her sister, and screwed up her family. Another very strange part of this is that, in a flashback, Kenzan talks to the hospital and seems to indicate that Chiemi only had one child (whereas Shouma and Kanba were supposed to be twins). Sapphire Pyro is all over this, with a matrix of possibilities for what this might mean. I don’t know what to make of this, and there is plenty in this episode to make my head hurt without thinking about it. Kanba gets a call (from Sanetoshi?) saying his sister will die again, and he looks up at a box in the corner. What is this? His parents ashes? This was a strange scene. 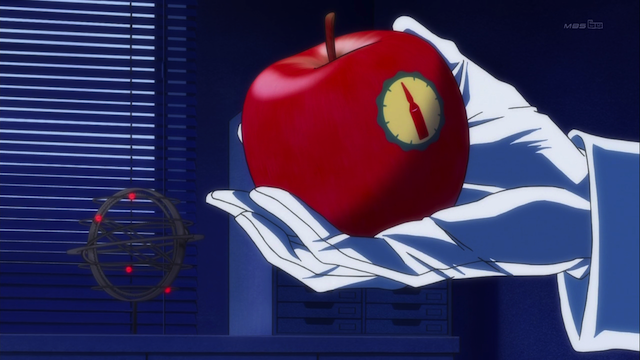 Well, this episode was full of them, but this scene stood out to me, because the box must contain something important. It almost looks like a domestic shrine, but usually those seem to have pictures of the dead. I’m sure there is meaning here, but I’m unclear what to make of it. Much of this episode turned out to be about Himari dying again. 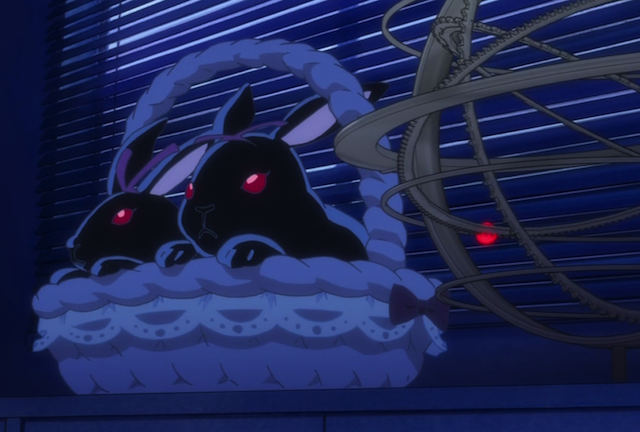 Now that the twins have lost the Penguin Drum, the Crystal Princess cannot maintain the host body, Before she dies, Himari warns Ringo and Shou that “the world has called forth dark bunnies once again”. I just need to pause here to say, WTF?!? As if in a trance, Shouma starts reciting some sort of allegory. As Himari dies, Shouma recites an allegory. There are probably many ways this can be interpreted. Sapphire Pyro’s post (which I linked to above), mentions the myth of Prometheus, and points out a whole blog post by Ephemeral Dreamer just on this allegory, which focusses on connections to the biblical Tree of Knowledge and the original “Mary had a little lamb” poem. I’ll put a different spin on it. There’s another myth that this reminds me of, although, like the others, it is highly modified. Amaterasu was a Japanese sun goddess. Long story short: she hid herself in a cave. The result was that the light left the world. With the Sun gone, crops whither, and life is misfortune. To bring light (and life) back to the world, a Shinto trickster goddess, named Ame-no-Uzume lures her out by setting up a mirror in front of the cave, and dancing naked. Amaterasu comes to the cave mouth to take a peek, and thinks her reflection is a new sun goddess that has been chosen. When she steps out, she is caught, and the cave sealed. In this case, Amaterasu is both the apple tree that has withered and caused the light to go out of the world, and the fire goddess dwelling in the cave. Ame-no-Uzume is the Prometheus figure that steals fire (by liberating it from the cave). Himari steals fire from Kanba's cave. The strange thing is thinking about how the allegory maps to the Takakura family. 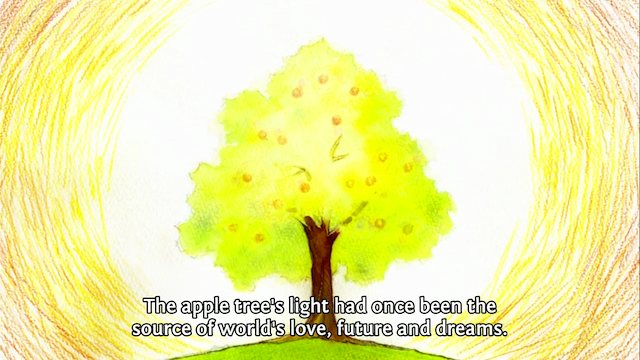 At first I thought that the withered tree was Himari and the taboo was between Himari and Kanba. I think it is possible that this interpretation ALSO is true, since I don’t think this allegory has a single meaning, but after a fashion an alternate mapping occurred to me. Himari as a lamb, is present from the start of the allegory. The one family member missing is Chiemi. There is a strong suggestion that Mary is actually Kenzan. 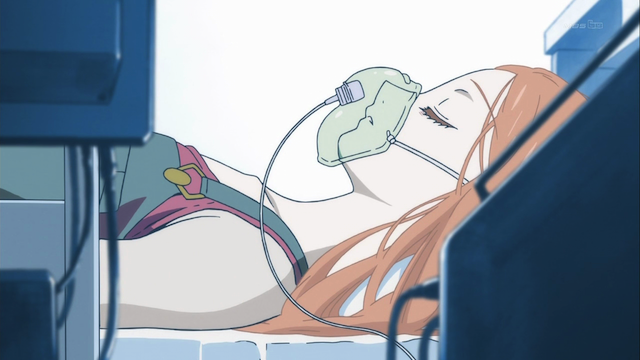 This suggests that Chiemi is the one who died (perhaps it is her ashes that are in the box?) and Kenzan did something to try to save her, and the result was that Himari died? Ow! Ow! My brain hurts! There is so much more that can be pondered about this episode. 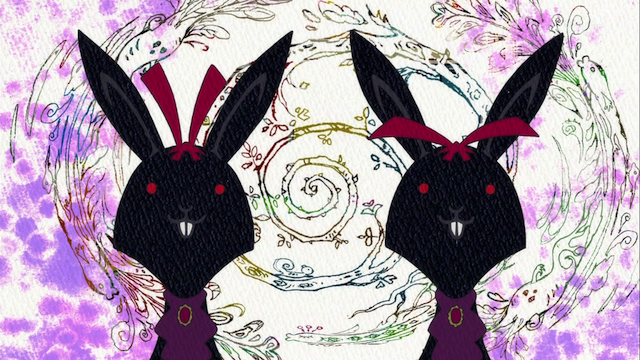 What are the “dark bunnies”? They don’t seem helpful, because they seem to be connected with Himari’s death. What was up with Tabuki’s hand? It looked like his fingers had been chopped off and re-attached. And what are we to make of Sanetoshi? He is attended by the dark bunnies, and that logo looks like either a bullet, or a plastic bottle, like the one used in the sarin gas attacks. Here, dearie. Try this juicy red apple. Few shows are as densely packed as Mawaru Penguin Drum. At the halfway point it is quite clear that this is the masterpiece everyone who has seen Kunihiko Ikuhara’s earlier work was hoping for. That box is just the shrine were they usually kept Himari’s penguin hat. 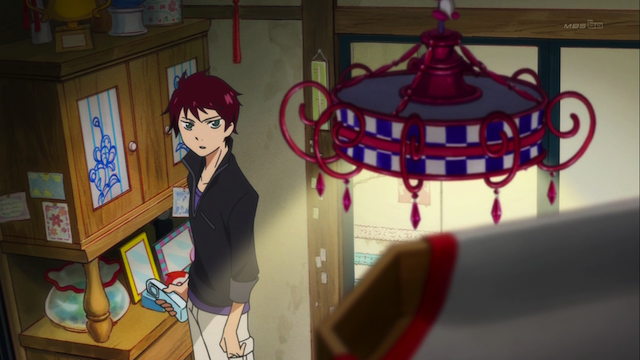 Kanba probably looked at it to confirm that Himari was in her “Princess of the Crystal” mode. How do you know it was where they kept the penguin hat? Thanks. I’m going to have to rematch this whole thing at some point. I agree with the box thing. I think he was thinking of the hat when looking at it. Ooo… I’m not that familiar w/ Japanese myths. But the myth you shared that could’ve matched Shouma’s tale is pretty interesting. I have a feeling that the three references I mentioned are just too obvious/easy. Haha. Well, one theory is that myth-builders take from pre-existing myths and fashion something useful in the current context. Claude Levi-Strauss called this Bricolage. As such, stating that any one story was the source for Shou’s tale is looking at it narrowly. Probably Ikuhara (the Bricoleur) had all of these stories in mind, and picked pieces here and there that suited his purpose.